Stories and graphics combine to make Through Early Yellowstone a beautiful, informative, and highly entertaining read. Before the completion of the Northern Pacific Railway line through Montana Territory in 1883, access to Yellowstone Park was extremely limited. Its pristine wilderness remained mostly unseen until the late 1800s except by a handful of hardy and brave souls who traversed mountains, rivers, geyser basins, and canyons in order to experience its grandeur. 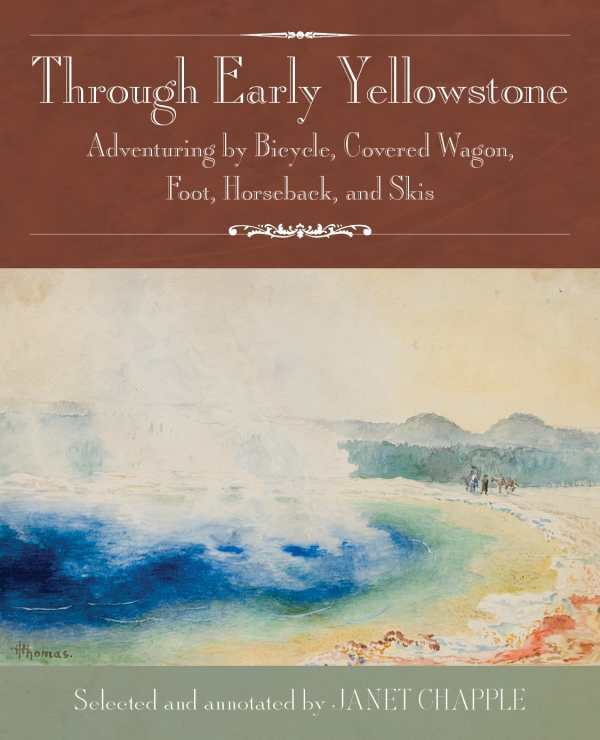 Janet Chapple has collected writings of some of these early adventurers and assembled them into a wonderful anthology, Through Early Yellowstone: Adventuring by Bicycle, Covered Wagon, Foot, Horseback, and Skis. Its release coincides with this year’s celebration of the creation of the National Park Service in 1916. The writings begin in 1871, before the park was a tourist destination, and continue up to 1916, when autos were first allowed into the park. One of the earliest visitors was Nathaniel Pitt Langford, whose expedition account was instrumental in the creation of the national reserve. Also included is Frank D. Lenz, who left New York City in June of 1892 on his bicycle and reached Yellowstone in late August. In 1905, Eleanor Quackenbush Corthell, a mother with seven children, traveled 1,200 miles by horse and wagon to give her family a memorable vacation. And C. Hanford Henderson, a teacher, walked the entire Grand Loop Road of the park, covering over thirty miles a day. Included in the anthology are over fifty historical photos and engravings, maps, and watercolors. The twenty-six watercolors, painted by Welshman Thomas H. Thomas in 1884, have never been seen outside of Wales until now and are particularly noteworthy. Stories and graphics combine to make Through Early Yellowstone a beautiful, informative, and highly entertaining read. Those who enjoy nature writing or armchair traveling will find this book to be a unique opportunity to experience Yellowstone Park through the eyes of those who saw it first. Their awe and jubilance, expressed in the parlance of the day, charms and delights.